Do we have the other Markers, as we've discussed in the past, finished yet? Looks like a definite improvement, especially after moving the ends to no go into the object. Thinner arrows would further help getting the widget out of the way. The length and pronounced pointy end keep the arrows visible. Something like this perhaps? I don't see much of an issue with making the arrow shafts skinnier, so long as the heads are clearly visible. However, for the rotation markers it would be a problem. Do we want separate widths or should we keep them uniform? In the latter case we would not want to make the shafts skinnier. Technically, that's just a fixed length. For larger objects it would still intersect the object, though I don't think it is as much of a problem. An image of the rotation markers, for reference. It looks like something needs to be done for rotation markers with smaller objects. I'm leaning towards adding more subdivisions when smaller, and increasing the minimum radius. Looks great! And yes, it makes sense to adjust the minimum radius according to the size of the object you're rotating. It indeed isn't a problem if the arrows intersect larger objects. Sounds like the way to go. Though I perhaps turning the rotational widget into a stick variant would also solve the issue (at the expense of having a non-standard shape compared to how most apps use circle ball for that)? 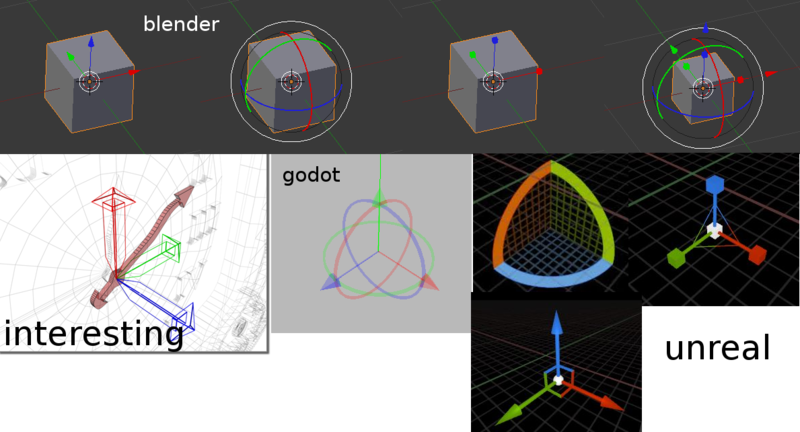 Maybe take a look at some 3D software, mainly Blender as many open-source people are used to it, and consistency with what they know will also help. I'd be interested in pursuing this route. The rotation markers were constructed by myself originally, and while my sense for aesthetics is perfect and infallible, the markers do not look as great in their current, revealing state (transparent). More input on this from others would be good. Additionally, it would be nice if Zini would comment whether he would approve the changes or not. Your statement is accurate, and I agree we should do so to a point. That said, the editor is specialized for different tasks than software like Blender and it also has structural differences that would make it difficult to replicate the functionality of Blender, so I think its fine if we diverge. Edit: Just joking about the perfect and infallible bit. I like the look of the skinny markers. The axial rotation marker is intriguing. I can imagine it being both beautiful and horrifying to use. These editors mostly keep the on-screen size of the manipulator constant to avoid the "fat circles", but that solution seems like one of the "3D editor things" and probably wouldn't be good to adopt in our editor. Also I like the bottom left example where the arrows get pointy towards the center - what do you think about that? Also I like the bottom left example where the arrows get pointy towards the center - what do you think about that? It's an interesting artistic choice, but functionally I don't see how it makes a difference. Perhaps I am missing something? It doesn't seem like the user would be able to easily click on the tapered portion. On a side note, I strongly dislike how it is drawn as a wireframe, and I much prefer the transparency approach.